The tenth anniversary edition above replaces the book below, which The Tactile Mind Press published in 2002. It went out of print in 2005. 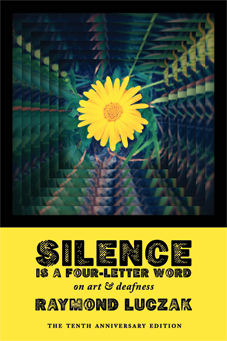 Silence Is a Four-Letter Word: On Art & Deafness (The Tenth Anniversary Edition). You can order the book directly from Handtype Press right here! In 2002, Raymond Luczak handed us his call to arms for deaf artists everywhere. 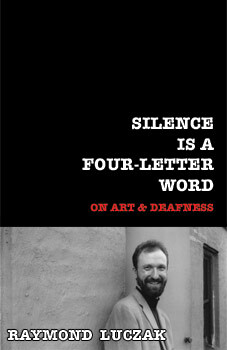 Ten years later, he revisits the book that challenged assumptions about being a deaf artist. Has anything changed? Yes and no. Luczaks meditations on what makes art art and deafness deaf asks artistswhether they are deaf or noteverywhere to rethink observations on their work and live differently. This tenth anniversary edition incorporates new observations made over the past decade. A new clip featuring the author talking about the book is forthcoming. Ebooks are available for the iPhone, iPad, iPod touch and Mac as well as the Kindle.